For most Scouts and adults, snow camping is the ultimate wilderness experience. There is nothing in the world like hiking on snowshoes through a wintery forest with a pack on your back, establishing a campsite, and sleeping in your own shelter. Sometimes, you even get to wake up and dig your way out of a snow cave that has been covered by an overnight snowfall. While this kind of adventure can be intimidating for some, Scouts who are lucky enough to have this experience will remember it forever. This is not to say that every boy with a pair of snowshoes and a good attitude should venture off into the snow. It takes some training, equipment, and conscientious leadership for a successful outing. And not all snow camping trips are the same level of difficulty.Click here for a description, from easiest to hardest, of the kinds of trips you might consider. If snow camping in caves isn’t quite your thing, then check out our recommendations for the best two-person tent. Choosing a lightweight sleeping bag can be tricky: down or synthetic? 20F or 40F? ultralight but expensive versus cheap but heavy? Let us guide you. Check out our recommendation for the best backpacking chair and make your camp R&R more comfortable. These three documents can be the basis for the training sessions. For each, a Scout might take responsibility for presentation. The video below explains how to dig a snow cave. Many Northern California Troops snow camp near Bear Valley in the Sierras. Drive to the end of Hwy 4 and park at the entrance to Alpine Lake. That’s as far as you can drive because the road is not plowed after that. You need Sno Park Passes for each vehicle that is parked (even for the afternoon). They can be purchased online – click here. Alternatively, Sno Park Passes can be purchased in Arnold on your way up to Bear Valley at SNAC, which is right after you enter Arnold. (If you pass the shopping center with the Round Table Pizza, you have gone just a little too far.) Vehicles will get ticketed at any Sno Park if they do not have a Parking Pass or if they do not have a front license plate. Be warned. Groups do not need camping permits in Winter but they always require Fire Permits. For more information, call the Calaveras Ranger Station at 209-532-3671. Even though these videos demonstrate survival after falling through the ice in winter, many of the same principles apply during the summer months if you end up in a cold-water lake. 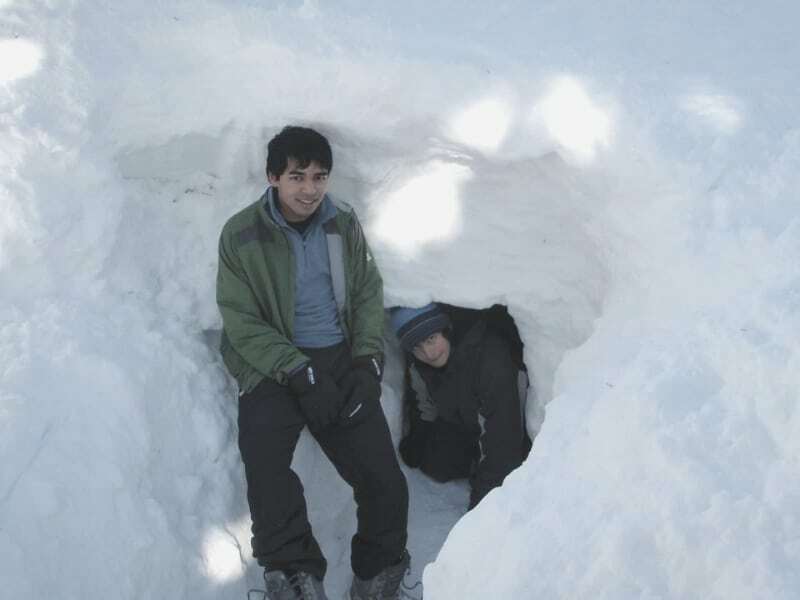 Snow Camping can be dangerous, especially if the weather turns bad or Scouts come unprepared. By far the most common problems come from the adults, who think they can “wing it” because they know how to take care of themselves. The best thing a trek leader can do with an adult who shows up at the pack check without the required equipment or with a bad attitude is to leave them at home! Please leave a comment about your snow camping experiences and where you have gone. I checked out Alpine Lake earlier this year (~Jan 2013) and while it looks like a nice place to snow camp, I found the snowmobiles to be extremely loud and very close by. In fact, you can see snowmobile tracks going through almost every square foot of snow around there. Snow camping really does rock….but sleep gear should be fully functional or you will suffer. But its really fun and everyone willing should try it. We snow camp every year and the Scouts love it..I am taking my 10 year old daughter snowcamping next week…she is very excited. We go to the Big Meadow area on Hwy 4. YEAAAAAA I will post another comment on here after snowcamping. This will be interesting.